With many recent discussions, both condemning and promoting the recent Hinkley decision. I can't help thinking we have missed a trick on a renewable energy strategy. Whilst I have a vested interest in any large scale infrastructure project across the UK. Due to my role at Collingwood and the opportunity it may create. I also cannot deny that with some of the contractual requirements on the amount of UK products and services there would be a beneficial impact to the UK economy both locally and nationally. However, I still can't get my head away from the fact we are an island nation which isn't lacking in innovation and ambition, and could quite easily develop a completely self sufficient renewables agenda. With the invaluable (FREE) resources we have because of our geographical location and the fact many of the prime areas for renewable investment fall within areas of the UK which would benefit hugely from the regeneration such a strategy may bring. I feel the decision may have been made through rose tinted glasses. I would like to think people, you are better placed and more informed than myself came to the decision with our long term best interests at heart. 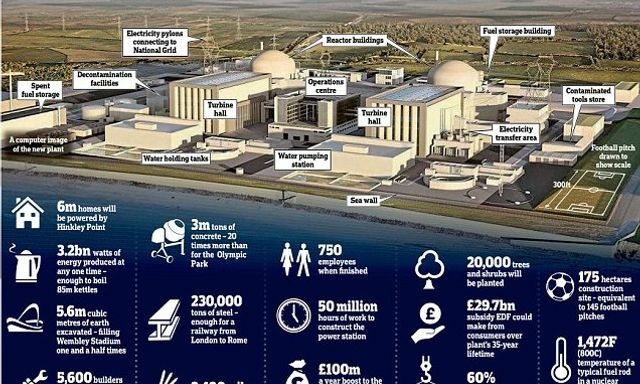 Controversial plans for the Hinkley Point nuclear plant were finally approved yesterday – despite national security concerns and claims it could cost every family an extra £1,000.Theresa May signed off the £18billion project after imposing restrictions to limit the influence of the Chinese state, which is helping bankroll the deal.The Prime Minister also announced plans for a ‘golden share’ rule to tackle wider security fears over future foreign investment in national infrastructure such as energy and transport.